The Winter Village Bluegrass festival features some of the country's top bluegrass artists. The January festival will continue in this tradition. The Gibson Brothers, from New York's Adirondack region, have risen to the top of the bluegrass world, winning 2 awards - Vocal Band and Album of the Year for Help My Brother at the 2011 International Bluegrass Music Association (IBMA) awards in Nashville. The Gibson Brothers will be opening the Winter Village festival, performing and leading workshops throughout the day and evening of Friday, January 27. For more information about the Gibson Brothers visit http://www.gibsonbrothers.com/ and check out this video interview with Eric and Leigh about their new CD "Help My Brother", the winner of IBMA's 2011 Album of the Year at http://www.youtube.com/watch?v=0orc4eF3i40 . Sierra Hull, renowned as a mandolin prodigy, is also a gifted singer, songwriter and bandleader. Now 20 years of age, Sierra has performed at Carnegie Hall and the Kennedy Center, been nominated by IBMA seven awards during the past four years (Emerging Artist and Mandolin Player of the Year), and recently completed a two-year music degree at Berklee College of Music in Boston on a full, Presidential Scholarship. Matt Glaser, head of Berklee's American Roots Music Program, put it this way: "She has no limitations as a musician." Sierra Hull & Highway 111 will be performing twice and leading workshops on Saturday, January 28. Sierra's second CD, Daybreak, was released in March 2011 on Rounder Records and the second video for the album's title track, "Daybreak," is featured on Country Music Television. http://www.cmt.com/videos/sierra-hull/693134/daybreak.jhtml. Sierra penned seven of the twelve songs on Daybreak, ranging from uptempo bluegrass songs, ballads and swing, to lively instrumentals. For a taste of what you will see live at Winter Village, check out Sierra and her great band Highway 111 performing Sierra's original song 'Tell Me Tomorrow' http://www.cmt.com/videos/sierra-hull/684545/tell-me-tomorrow-live.jhtml and numerous other live videos including Sierra's great instrumental video 'Chasin' Skies'. Tony Trischka was born in Syracuse, NY and made his recording debut in 1971 on the legendary Ithaca-based band, Country Cooking's "15 Bluegrass Instrumentals" album. For more than 35 years, he has inspired a generation of bluegrass and acoustic musicians. He is not only considered among the very best pickers, he is also one of the instrument's top teachers, creating numerous instructional books, recordings, and videos. Recently he has played with Steve Martin and Bela Fleck (his former student) on the Letterman Show, and produced Steve Martin's most recent banjo recording "Rare Bird Alert". Tony's most recent CD Territory has been nominated as the Americana Album of the year by the Independent Music Association. His band Tony Trischka & Territory, features vocalist and guitarist Michael Daves, Skip Ward on bass, and special guest Darol Anger on fiddle. Tony and his band will be performing afternoon and evening sets and leading instrumental workshops on Saturday, January 28. "...the godfather of what's sometimes called new acoustic music" - The New York Times To learn more about Tony and his band, visit http://www.tonytrischka.com . To view a great Charles Osgood video interview with Tony and Bela Fleck see http://www.youtube.com/watch?v=zfwOYsYxO7s and to see Tony and Michael Daves with Steve Martin on Letterman, visit http://www.tonytrischka.com/media.htm. For more on Michael Daves and his work with TTT and Chris Thile, visit http://www.michaeldaves.com . Visit http://www.darolanger.com to learn more about the music of fiddler Darol Anger. 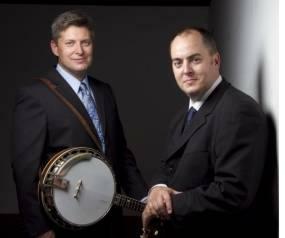 Both Tony and Darol teach through the Academy of Bluegrass at http://www.academyofbluegrass.com/ . Rebecca Colleen, at 17 years old, sings with style, control and sensitivity far beyond her years. Rebecca and her band have performed festivals and concerts throughout the Finger Lakes including WVBR's 'Bound For Glory' and the Grey Fox Bluegrass Festival in 2011. Next year, look for RCCL to release their first CD and host the Brantling Bluegrass Festival, from August 2-5, 2012 in Sodus, NY. The Chore Lads feature Peter McDonald on fiddle, guitar and mandolin, Dave Borisoff on banjo and dobro, and Doug Henry on bass. To learn more visit http://www.rebeccacolleen.com . The Jesse Alexander Band is the host band for Pickin' in the Pasture, the Finger Lakes region premiere summer bluegrass festival. At only 13 years old, Jesse is an accomplished fiddler and mandolinist, has recorded two albums and has appeared at numerous festivals in the northeast this year. Jesse's band focuses on traditional bluegrass music and includes his dad Andy on banjo, his mother, Susan on bass, and his long time friend Luke Parsnow on guitar. Visit http://www.pickininthepasture.com/bands to learn more about Jesse and Pickin' in the Pasture. Friday will feature performances and workshops by the Gibson Brothers. Instrumental, vocal and songwriting workshops will be presented during the afternoon between 1 and 4 pm. A special unplugged performance will held at 4 pm. The opening happy hour reception will be from 5 – 6 with a southern comfort food dinner served between 6 and 7 pm. Rebecca Colleen and the Chore Lads will open the evening performance at 7:00 and the Gibson Brothers will perform two sets on Friday evening between 8 and 10:30 pm. Saturday will feature performances and workshops by both Sierra Hull & Highway 111 and Tony Trischka & Territory. Instrumental, vocal and songwriting workshops will be presented during the morning and early afternoon hours at La Tourelle. Afternoon performances will begin at 2pm with the Jesse Alexander Band, followed by Tony Trischka & Territory at 3pm and Sierra Hull & Highway 111 at 4pm. Dinner on your own will follow from 5 – 7pm in downtown Ithaca, followed by the Saturday night concert at the Hangar Theatre. Cornerstone will open the show at 7:30 pm, with Tony Trischka & Territory following at 8:15 pm and Sierra Hull & Highway 111 at 9:30 pm. Sunday morning will feature unplugged performances with festival performers and guests from 10am to 12 noon. For ticketing and more information please visit www.WinterVillageBluegrass.org.